WASHINGTON — Major military drills between South Korean and U.S. forces will be put on hold, likely until the Paralympics finish in mid-March, Secretary of Defense Jim Mattis has confirmed. But he cautioned against seeing the pause in military activates as a quid pro quo to North Korea’s recent decision to open lines of communication with Seoul. The decision to hit pause on the drills, which was requested by South Korea and agreed upon Thursday morning, was a matter of logistics, Mattis told reporters Jan. 4 at the Pentagon. “I would say for us, it’s a practical matter,” Mattis said, emphasizing that the number of tourists expected for the Olympics and the police presence needed to secure them would make doing the military drills, which spread through South Korea, a logistical nightmare. The Olympics, being held in the South Korean city of Pyeongchang, come amid a year of heavy tension between the two Koreas. But there is hope among officials in Seoul that the games will act as a background for talks between the governments of Kim Jong Un and Moon Jae-In. That hope has spiked in the early days of 2018, following North Korea’s use of a communication line with South Korea that had been dormant for two years, and suggestions from Kim that representatives from the two nations could meet soon —something South Korean officials were quick to support. 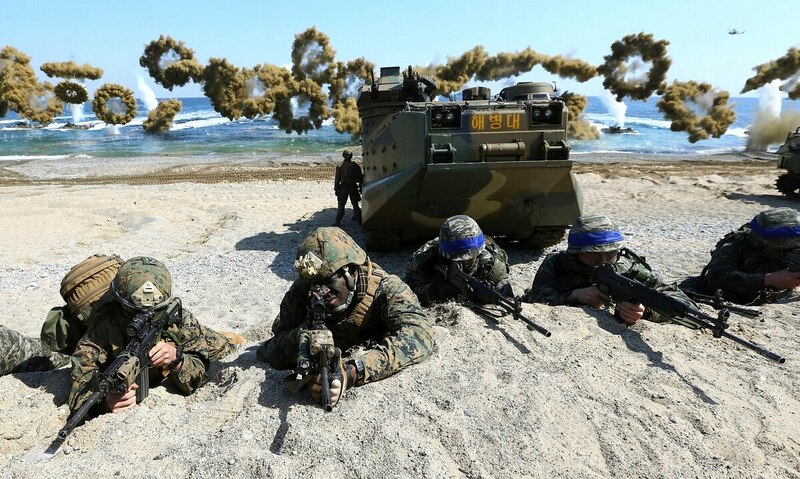 Just days later, the U.S. and South Korea agreed to postpone their annual military drills, which have for decades been a tension point with North Korea. In the past, the U.S. has used postponing the drills as a reward for good behavior from North Korea — but Mattis stressed that was not the case here. The original announcement from the Pentagon that the exercises would be paused did not specify if it only included the Olympic games scheduled from Feb. 9 to Feb. 25, or if it also covered the Paralympics, which run from March 8 to March 18. However, the secretary noted that infrastructure and tourists don’t simply disappear come March 19, indicating that the exercises will take a bit of time to gear up for after the Paralympics come to an end.